Plastic waste management is one of the major problems worldwide. Plastics production utilizes valuable fossil feedstock and has a notable carbon impact. They are not only hard to decompose but are also occupying our landfills and entering the oceans. Over the years, plastic production has increased from 15 million tonnes in sixties to 311 million tonnes in the year 2014. In addition, the production is believed to get double in the coming 20 years. According to a report from the World Economic Forum, the oceans nearly carry over 150 million tonnes of plastic and with this rate by 2050, plastics will exceed fishes (by weight). Entrepreneur Gregor Gomory, CEO of ByFusion inspired by the research of a New Zealand based engineer Peter Lewis, has come up with an innovative technology to create a building material from different kinds of scrap plastics that do not end up being a waste again, (rather can be reused as important technical or biological nutrients). ByFusion is a process that converts plastic debris into building material. 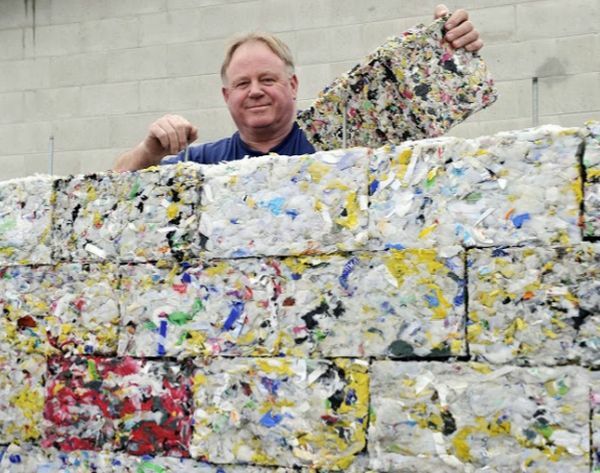 Gomory’s company uses plastics collected from oceans and compresses it using giant machines into blocks known as RePlast. These blocks are of the dimension and size similar to concrete blocks and hence, can be easily employed in various developments, infrastructure and construction works. The density and shape of the building blocks can be altered to meet the requirement for other projects as well. The process of ByFusion can operated by either electricity or gas. And it is self-contained and portable. The process is also eco-friendly as it is almost 100% carbon neutral. The characteristics of RePlast are that it does not require glue or adhesives, it can contribute to LEED certification for construction and it has a 95 percent lower greenhouse gas emissions in comparison to concrete blocks. It has a very high thermal and sound insulation. RePlast blocks have undergone primary independent tests in controlled settings, for compression, R-value and shear strength. In addition to testing, it has successfully completed dozens of field tests. So far, RePlast has been used in construction walls and road barriers that withstood severe environmental exposure including multiple earthquakes, without displaying any detectable signs of stress or deterioration. Globally 300 million tonnes of waste that is generated per year, out of which less than 8% gets recycled while the rest 276 million tonnes reaches landfills and 4 million to 12 million tonnes pollute oceans. Therefore, this new ByFusion technology (although still in the pilot phase) seems very promising in tackling the issues of plastic wastes.